Although WordCamp US was full of hope for the future of the platform, it wasn’t without conflict. The night before the conference began, Pantheon’s $100,000 sponsorship was pulled leaving the company without a booth. 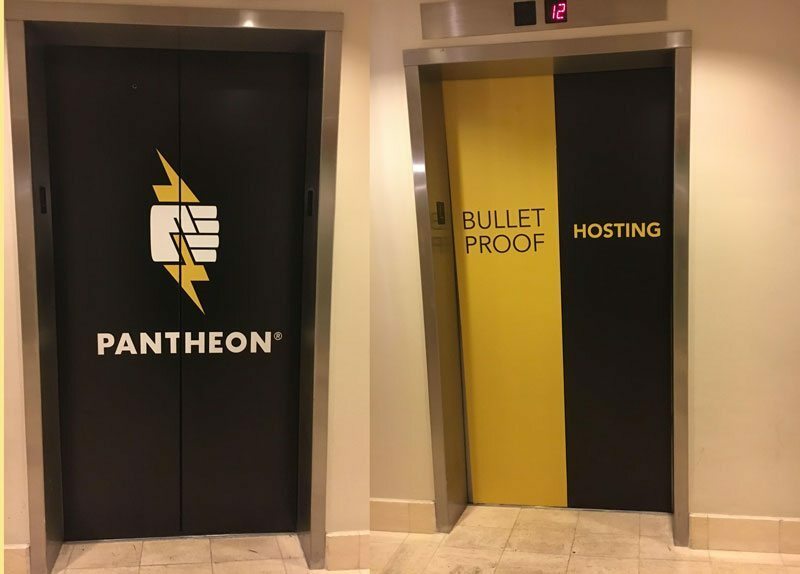 The decision was made after attendees were greeted by Pantheon logos in the official WordPress US hotel, the Downtown Sheraton. Both the concierge desk and elevators were covered with Pantheon marketing materials. This kind of marketing isn’t unusual in the world of commercial conferences. Sponsors of E3 and Dreamforce put up billboards and ads on buses. However, WordPress and WordCamps are inherently different and the community operates in a specific way. This is how the conflict began. In the days leading up to the conference, WordCamp US organizers sent Pantheon an email asking the company to remove all of the ads, even threatening to do it themselves. Organizers argued that purchasing the ads put the company at an advantage other sponsors didn’t have. The hotel was considered an extension of the official WordCamp venue, so organizers wanted to level the playing field by removing Pantheon’s ads from the Sheraton. Because the company had already paid for the package, the email was met with hostility. The refusal to comply with the request led WCUS organizers to dismantle the Pantheon booth and refund the $100,000 sponsorship. The ads didn’t break any explicit sponsorship rules, however, the way in which Pantheon employees represented themselves during the conversations resulted in a violation in the Code of Conduct. This is what led to the removal of the booth. 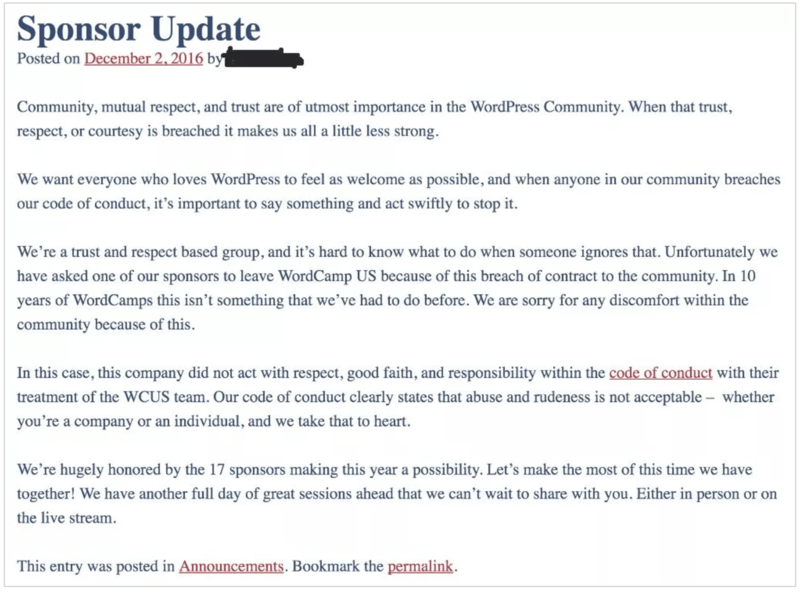 On Saturday, a blog post was published on the WCUS blog called “Sponsor Update.” The post outlined the need for respect in the community and states that one of the sponsors was asked to leave. Pantheon’s name is not mentioned. The post claims the group in question violated the code of conduct and that “abuse and rudeness are not acceptable.” Shorty after being published, the post was taken down. Regardless of how you feel about the situation, the language in the sponsorship rules is unclear. Though the rule about ads may be unspoken and understood between most sponsors, it isn’t written explicitly. WordPress co-founder Matt Mullenweg told Torque that they will be expanding some of the language in the sponsorship terms. “It is impossible to anticipate every possible variation of what people shouldn’t do and enumerate it in contracts or guidelines, but we will be expanding some of the language in sponsorship terms,” he said. Hopefully, the guidelines will dig further into what sponsors can and can’t do, but until that is done, Mullenweg suggested asking an organizer if you want to do something you’re not sure about. “If any sponsor is in doubt or trying something ‘new’ around a WordCamp, please check with the organizer first, and of course please listen to the WordCamp organizer if they say something is inappropriate,” he said. Last year saw a record number of WordCamps and WordPress meetups. There were 115 WordCamps and 3,193 meetups across 58 countries. That number is going to continue to grow the more people join WordPress. Different companies are going to become sponsors and it’s important to have a mutual understanding from the sponsors and organizers. “The Foundation is extremely grateful to the 1,036 sponsors in 2016 that caused no trouble and helped make events great for tens of thousands of attendees around the world,” Mullenweg said. Editor’s Update 12/9/2016: Post was updated to include quotes from Matt Mullenweg.